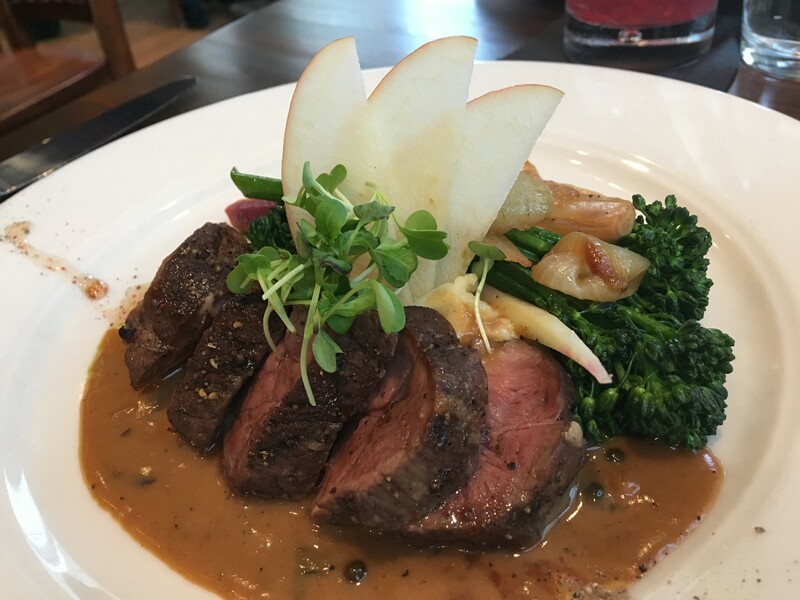 Wild Sage is offering a succulent pork tenderloin as an entree option on its $31 Inlander Restaurant Week menu. Inlander Restaurant Week is about halfway over, but there's still time to catch some of the delicious meals being served by more than 100 restaurants throughout the region. 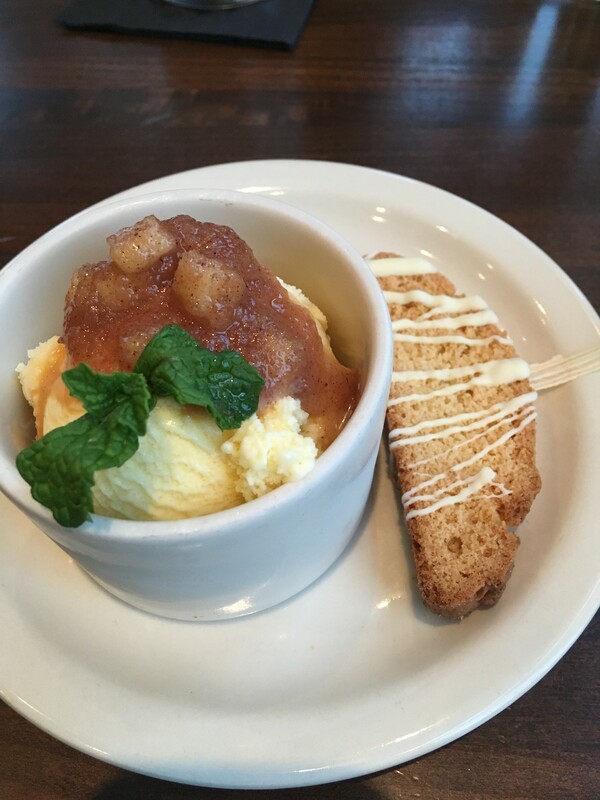 Wild Sage's goat cheese ice cream is a perfect balance of tart and sweet, topped with an apple compote with biscotti on the side. On Saturday, a couple friends and I hit up Wild Sage's $31 menu (a steal of a three-course meal for a place where an entree can run you more than that). If you're hankering for something rich and creamy to start, go with the sweet basil arancini for your first course, but for something a little lighter, I'd recommend the Wild Sage salad, which packs a deceptively large amount of greens into an artfully rolled slice of cucumber. For the mains, we tried the creole shrimp arrabiata and the pork tenderloin au poivre, which was succulent and juicy, served on a bed of mashed Yukon potatoes with roasted garlic and broccolini. Find comfort and respite from the frigid winter weather in the cozy basement of this Coeur d'Alene eatery opened last year by renowned regional chef Adam Hegsted. My partner and I made the trek from North Spokane out to Coeur d'Alene to sample Honey's $31 Restaurant Week menu this past weekend for an early Saturday evening meal as we learned the restaurant doesn't take reservations and thus we knew was bound to get busy (it did). That considered, service was a little delayed at times, but we also observed what appeared to be a short staffing issue that evening. Honey's main course option of cedar-cooked steelhead trout. Two egg dishes feature front and center for Honey's first course choices; we ordered the Scotch egg, soft cooked, wrapped in sausage and fried, with a honey mustard sauce for dipping. Our other choice was the Idaho potato rolls, and despite the name and menu description, the format was unexpected: two large deep-fried potato dumplings between slider buns, topped with a savory-sweet tomato chutney. 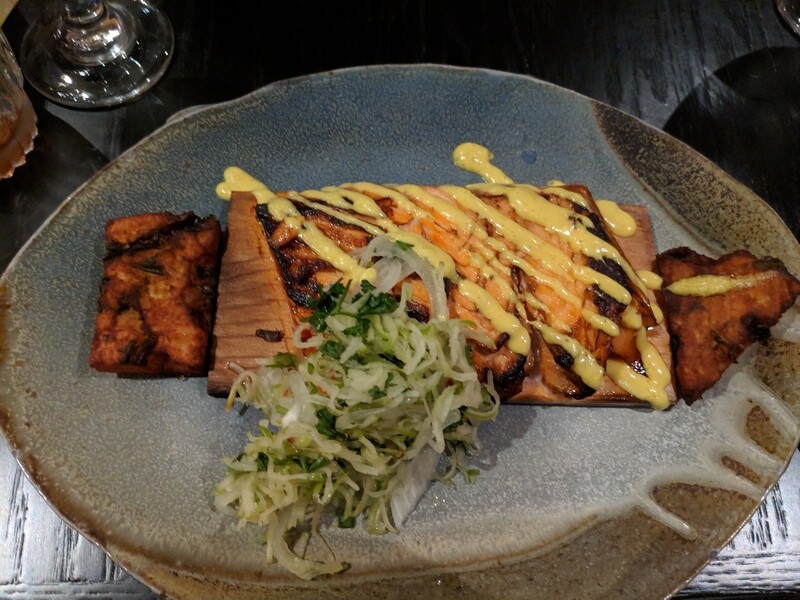 The carb-heavy option wasn't a bad choice for me since I pre-planned to order the cedar-cooked trout for my entree, a light and bright dish of steelhead served on a plank of cedar with a tart apple slaw and curry aioli on top. The combo of the fish with warmly spiced aioli and sweet slaw was a magical dance for my tastebuds. My guest, meanwhile, picked the super indulgent and perfectly breaded honey-fried chicken, twice-fried with mashed potatoes, a biscuit, coleslaw and pickled jalapenos. Unlike my fish, which was certainly not a small plate of food, this portion was enormous, and he definitely took about half home to enjoy later. For dessert, we picked the banana bread, egg battered with a maple-peanut glaze and caramelized bananas and peanut butter ice cream ($2 extra). I picked the "candy bar," a homemade concoction of bacon nougat, pecan butterscotch, dark chocolate and sea salt — definitely not your average check-out line staple! Another eye-catching appetizer: Three Peaks' creative take on pork belly. Three Peaks restaurant at the Spokane Tribe Casino might be one of the best hidden $21 menu gems participating in Restaurant Week. The portion sizes for most of our dishes were huge, meaning the already affordable three-course meal can wind up providing some leftovers for lunch the next day if you ask for a to-go box. Between the four of us, we shared a couple servings of the delicious pork belly on watermelon, as tasty as it is beautiful. 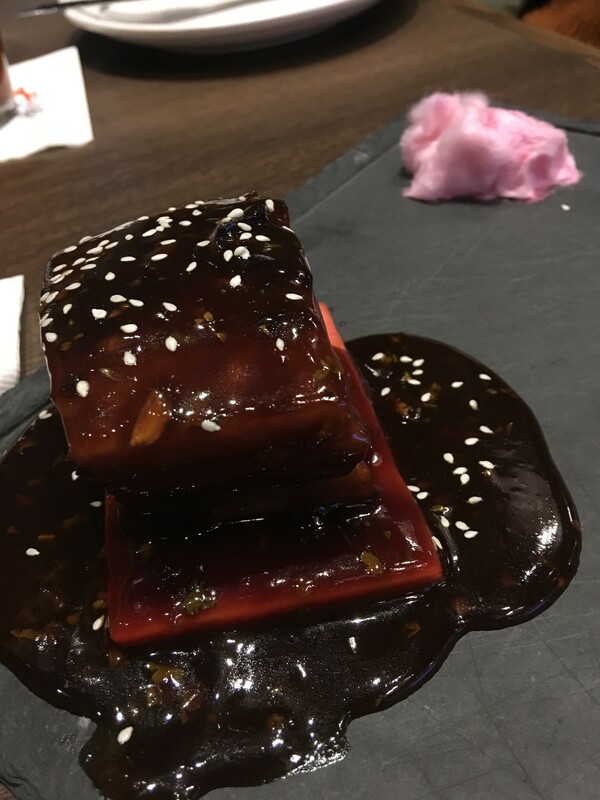 It sounds weird for something that's already topped with sweet hoisin sauce, but seriously, try a little piece of the cotton candy with your bite of pork and watermelon, and you'll see the sweet-salty genius of this dish. We also shared a plate of the calamari (cooked to perfection) and the Mediterranean salad (super flavorful with artichoke hearts, feta, olives and more), and that was just the first course. 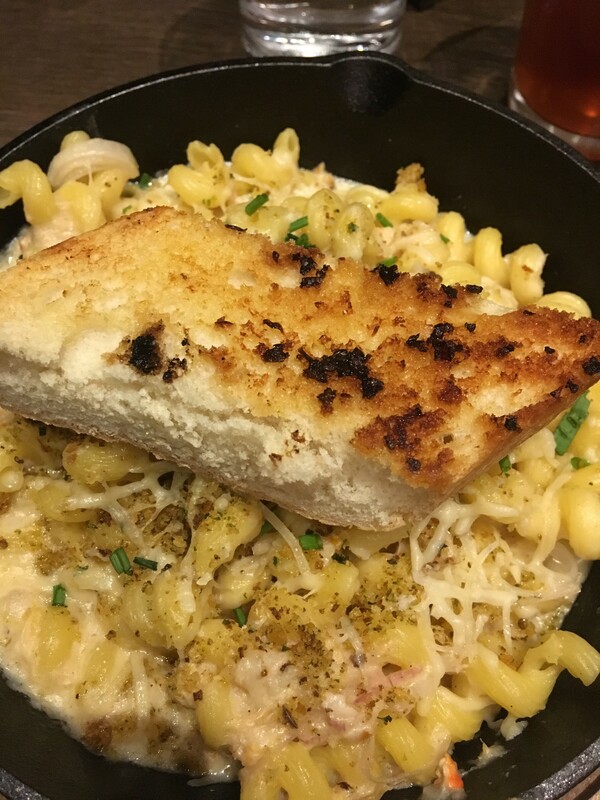 Crab mac and cheese is a main course choice at Three Peaks. Steak frites and the skillet crab mac and cheese won out for the mains, though we're sure the airline chicken is great, too. As someone who went into the meal hungry, I can tell you this mac and cheese with loads of crab was very creamy and tasty, but I couldn't even finish half of it because it was so hearty. Thankfully our server was more than happy to bring us boxes to take our leftovers home.